The passenger compartment remained stable in the frontal impact. Double pretensioners ensured that the dummies' knees were kept away from the dashboard, and low readings were recorded. However the steering column and ignition barrel were though to present a potential risk of injury to drivers of different sizes. The chest lost a fraction of a point in the side barrier impact. In the more severe side pole test, rib deflections indicated marginal protection of the chest. Protection of the neck against whiplash injuries was good. Based on dummy readings in the frontal and side barrier tests, the Sorento scored maximum points for protection of both the 3 year old and the 1½ year old infants. The heads of both dummies were properly contained by the restraints in the side barrier impact. The passenger airbag can be deactivated to allow a rearward facing child restraint to be used in that seating position. However, information provided to the driver regarding the status of the airbag is not sufficiently clear. The protection provided by the front edge of the bonnet to pedestrians' legs is poor. The protection offered by most of the the bumper was rated as marginal, although some points towards the centre of the car performed well. In most areas likely to be struck by the head of a child, the bonnet offered poor protection. For adult, the bonnet offered good protection towards the centre but was rated as poor along the edges, where it is supported by stiff structures. 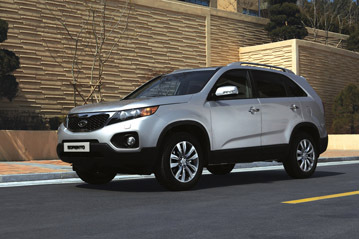 Electronic stability control (ESC) is standard equipment on all Sorento variants. The car also has a standard-fit seatbelt reminder system for the driver and front seat passenger.